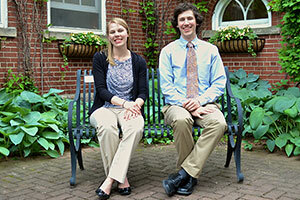 Abigail Puglisi, DO, and Neil Cox, MD, together in 2014, when they began their residency. Abigail Puglisi, DO, can’t wait to care for her friends and neighbors in small-town Wisconsin. Neil Cox, MD, is eager to care for people of the Ho-Chunk nation at the tribe’s health center in Black River Falls, Wisconsin. Just months after graduation, the two 2017 alumni of the DFMCH’s Baraboo Rural Training Track (RTT) are the Wisconsin rural physicians they aspired to be. And both say they couldn’t be more ready. Dr. Puglisi, who provides outpatient and inpatient care, including obstetrics, at ThedaCare Medical Center in Berlin, Wisconsin, chose the Baraboo RTT because it allowed her to be a rural physician right away. “I was given autonomy to develop my own practice style, pursue my own interests and function as an independent adult learner,” she recalls. Being able to work like a junior partner during residency has made her transition into practice easier. Dr. Cox was first drawn to family medicine’s breadth, preventive focus, and service to less-represented communities. “I like being able to take care of anyone who walks in the door at any stage of life,” he reflects. With broad training from the Baraboo RTT, he’s entering practice confident in office procedures, endoscopy and obstetrics with surgical delivery. Like Dr. Puglisi, Dr. Cox looks forward to caring for a panel of patients, especially at the Ho-Chunk nation, and is grateful to the Baraboo RTT for all it taught him. “The opportunity to relieve some of the access to care disparities has been great,” he says. Drs. Puglisi and Cox, we are so proud of you. We know you are great rural family physicians, and we look forward to keeping in touch! Rural Health Equity Track residents Kelsey Schmidt, MD, and Karyn Cecele, MD. In the last year, the DFMCH has further strengthened rural graduate medical education opportunities in family medicine. With support from a Wisconsin Department of Health Services grant, the Madison residency program expanded to include a new Rural Health Equity Track at its Belleville clinic. 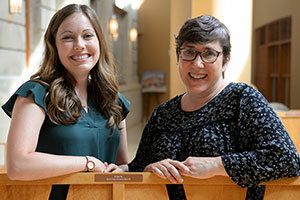 Kelsey Schmidt, MD, and Karyn Cecele, MD, are the first two residents on that track, which focuses on eliminating health disparities for people living in rural areas. In addition, the DFMCH formalized an academic partnership with the brand-new Aurora Lakeland Rural Training Track Family Medicine Residency. The first four residents in that program began their training in July.